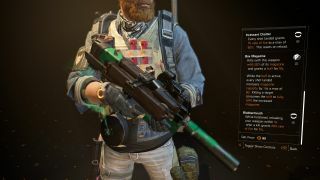 Our guide to getting The Division 2's much sought after exotic SMG, The Lost Chatterbox. The Division 2’s Exotics are a lot rarer than they were in the first game. They're special weapons that have unique abilities that push them to the cutting edge of the game’s loot—gone are the days of dropping in to your Base of Operations’ vendor and just picking up a Valkyrie or Damascus. Now you have to work for them, and gosh, do they take a lot of work. One of the most coveted Exotics in The Division 2 at the moment is The Lost Chatterbox. A Hyena-modified P90, the Chatterbox has ludicrous abilities that make it one of, if not the, best SMG in the game. Rate of fire is the Chatterbox’s main draw, as the Incessant Chatter talent increases its ROF by one percent for every shot landed, up to a cumulative total of 60% until it is reloaded. The Blabbermouth talent is slightly complicated. Holstering the Blabbermouth, getting a kill with another weapon, and reloading that weapon within five seconds of a kill will trigger a 10-second, 20% buff to your rate of fire. This skill synergises well with practically any weapon, but weapons with higher damage but slower firing rates, like shotguns and marksman rifles, may both trigger and benefit from the buff the most. Perhaps most excitingly, Box Magazine applies a buff for 10 seconds when killing an enemy that increases your magazine capacity by one for every landed shot. On getting a second a second kill, the buff is consumed and your entire magazine is reloaded. With a bit of clever targeting (focus on a weak enemy for the initial kill, a more armoured one for the buff, but not too strong that you can’t kill it in the 10 seconds, then repeat), the Chatterbox is a short-range lawnmower, firing faster and never stopping as long as the kills keep coming and the talents stay active. Unfortunately, as you’d expect for such a powerful weapon, getting it can be a royal pain that relies mostly on just dumb luck. First, make sure your crafting bench in the White House is upgraded to its maximum (which becomes available in World Tier 4). This isn’t required, but with all the effort you’re going to to get it, you might as well have the highest gear score Chatterbox possible. Next, you’ll want to farm as many Hyena Keys as you can, which we already have a guide on. To make a long story short, head into the underground tunnels and look for key boxes on the wall. It’s random chance which faction key you get from a box, so you’ll just have to try every Underground until you have a decent enough stash of Hyena keys. At the absolute minimum and with perfect luck, you’ll need four of them—although I burned through about 12 before finally getting all the parts. The next step is hunting for Hyena caches. These can be found strewn across the open world and within missions, although they’re fairly well-hidden. They tend to be most common in the east of Judiciary Square, to the northeast of the Federal Square safehouse, and in the three main Hyena invaded missions, Grand Washington Hotel, Jefferson Memorial, and the District Union Arena stronghold. In these crates, you’re looking for three parts: the SMG Loaded Canister, the SMG Creative Magazine, and the SMG Modified Mods. Contrary to popular belief, there aren’t any specific missions or areas these parts drop in. As long as it’s a Hyena cache, you have a chance of getting the parts. Don’t worry if you don’t get all the parts you need. Both the key boxes and the Hyena caches reset 24 hours after they were last opened. Wait a day, and you can start the whole cycle again. Finally, you need the actual Chatterbox blueprint. For this, you will need to be at World Tier 4 to unlock the Bank Headquarters mission’s Challenging Difficulty. Near the start of the mission, just before we reach the bank vault, there is a room that looks like the chairman’s office. On the left side of the room, there is a panel in the wall with a keypad next to it. Activate this to get an RFID card, and Manny Ortega will ponder over the comms as to what it opens. It’s vital you get this now, as the door will close behind you when you get too close to the bank vault and make acquiring the blueprint impossible. Once you’re in the bank vault, there is a long room filled stacks of money. On the left side, near the entrance, is a locked gate. Activate the keypad and, if you have the RFID card, it will open. Inside is one last Hyena cache. Unlike the components, this one isn’t random chance. Open it and you should get The Lost Chatterbox Blueprint, at which point you can ditch the rest of the mission if you want. Once done, take this blueprint to the crafting bench at the White House, and there you’ll be able to craft the Chatterbox. You’ll also need 30 Polycarbonate, 22 Titanium, 69 Receiver components, and 812 E-Credits. Despite being a total nightmare to get all the pieces for, the Chatterbox is a very powerful, very fun-to-use weapon. It’s particularly good at mowing down tanks, as the rate of fire ramps up so quickly when sustaining fire that it makes short work of their armour. As long as you’re patient and a little bit lucky, you’ll be running around with the Hyena-branded P90 in no time.